Scott and I both do the laundry at our house. Neither one of us really loves to do it. Who does, right? It's easy enough to collect the clothes and get them into the washer and moved into the dryer next. But it is a whole different story to actually get them folded and put away. Our laundry room has absolutely no space. We need a flat area for folding when the clothes are dry. This isn't going to happen for some time. So, instead they get dumped into a laundry basket in the living room. It used to be a chair but now seating space is at a premium. 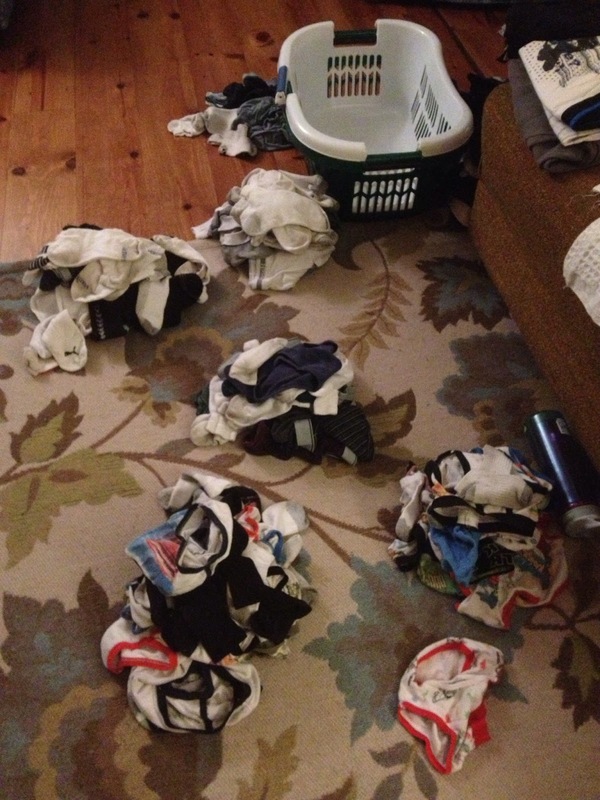 Once the pile gets high enough, we start to fold it. Eventually the folded piles make it up to bedrooms, albeit much smaller piles than when they started out from this constant need to have to wear clothes everyday. Sometimes the clothes even make it into a dresser drawer. 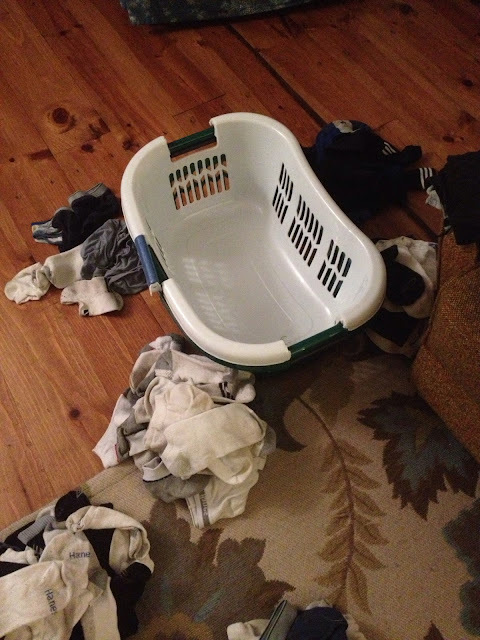 But the socks and underwear are left in the laundry basket. This is where they reside. In fact, I think the socks lived there the entire summer. Not one put away. When they needed clean underwear they knew where to look. I detest matching up socks. I figured with school starting it was time. Time to clean out the laundry basket. It was always nagging at me whenever I walked by it. Taunting me. It drove me crazy. I wanted to be organized for the start of school. I wanted the boys to be able to get fully dressed in their bedrooms if they wanted instead of coming down the stairs naked to get underwear. So I finally arranged it into piles and then folded/matched the items and put them away. It felt great. I wondered why I didn't do it sooner. It wasn't as bad as I had made it out to be. Empty basket at last. I recently had an epiphany when I used this clean-out concept on myself. Let me give you a brief history to help you understand what I'm saying- I was a very spoiled kid. If someone did me wrong I let them know and didn't let them forget. I didn't easily let things go or forgive. I got even with my brothers and sisters. I kept score and evened things up when out of balance. I kept track of past hurts. When my dad got rid of our family dog, I worked at being mad at him. I would wake in the morning and remind myself of his evil deed. This has been a hard thing to change about myself. Only in the past few years have I made huge strides. But every once in awhile I let old ways creep in without even realizing it. Every so often I take a good, hard look at my heart and clean it out. I let go of harsh words said to me or past hurts. Things I don't even realize I'm hanging on to. I unplug the scoreboard. I pray. I pray for forgiveness for my wicked heart. And then I feel amazing. So good. And I wonder why I didn't do it sooner.